A new summer top on the pins has stalled as my attention has been taken over by my return to one of last year’s spring/summer WIPs. For the first time in ages I have actually enjoyed returning to a project ! Over the last week I have knitted a whole sleeve, started another and finished a front piece of this cardigan (which actually if you can work it out, though I shall say it here, I had the back, one front piece and three quarters of a second front piece knitted.) Usually my WIPS remain WIPS for much longer – this one is less than a year old – Hurrah! You never know I might actually finish this time. I am working to time, there is a date I need to wear this top! There were three main problems before – one, the season changed and I realized I wouldn’t need to wear it for a while, two, the DK yarn seemed more like 4ply so wasn’t growing quickly enough, and three, there is so much temptation in the yarn and patterns I see wherever I go that I just itch to start new projects all the time. I suppose one less issue is that I no longer work in an environment surrounded by temptation. I no longer work in the yarn store, so ideas for my next project, and so on, are not thrust right under my nose. This could be good for me – it definitely is budget-wise – and one day I may (I say ‘may’ loosely) see the bottom of my stash, though I doubt it as there will always be some yarn in there I just don’t fancy. Maybe I shall even end up gifting a little of that yarn one day, indeed why do we all keep so much stuff? I know I am not alone here. 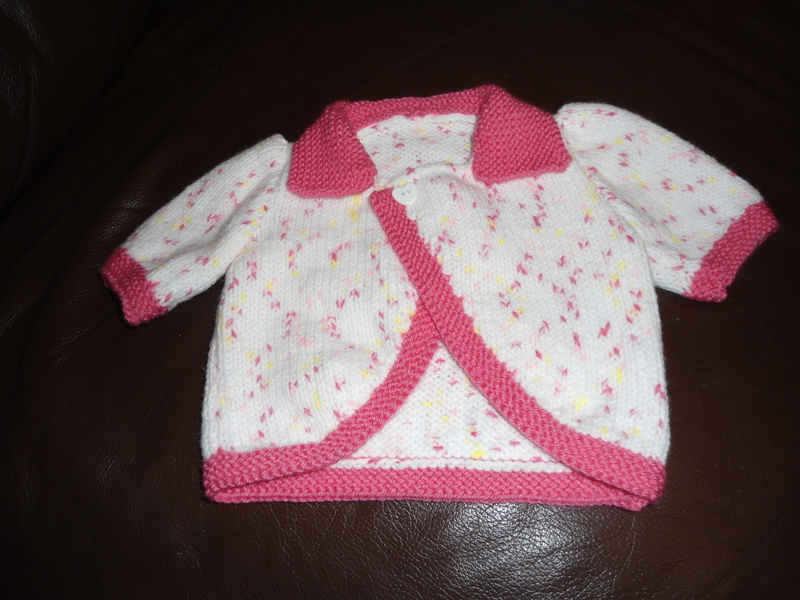 Just for a knitting pic here I have added a little photo of a baby top recently completed. I love seeing a pic on blog posts – hope you do. I was thinking today of all the knitting I have learned to master over the last ‘beep’ years. I say ‘beep’ because when I add up all the years of knitting I sound much older than the years I actually am in my head! My first memory of holding my own knitting sticks must have been when I was less than five years old, sitting with my mum, clicking a pair of yellow plastic stemmed knitting needles together the same way my mum seemed to be doing. I really thought I was knitting as I was making the same noise, albeit without any yarn but I don’t remember being disappointed that I had nothing to show for it. Today I rediscovered those yellow plastic knitting needles! The first true memory of knitting something recognizable was when I was in the second year infants, Year 2 to today’s kids, when Mrs Ralph (I remember she was a very rotund, mumsy teacher!) helped us to knit our own garter stitch teddy bear. I wish I still had him to giggle at! So you could say I started very young but I didn’t knit continuously. In my early teens it became quite fashionable to knit with one huge needle and one standard size with mohair mix yarns. My best friend and I could knit a short jumper over a weekend. We thought we were the bees knees creating marvellous lacy tops in fluffy multicolours. Then as the mid 1980’s arrived knitting took a nose dive and our eagerness with it did. We discovered boys and discos! That pause in knitting lasted for about 15 years, resurrecting when friends starting producing offspring and I could knock out fairly simple first size cardigans and impress them with baby gifts. Then when I had my own son I enjoyed showing him off in handknits made by my mum, my Nan and by myself and knitting really came into it’s own again in our house. My husband wasn’t impressed with his son in cardigans, but he got over it once he heard others coo-ing our boy in his beautiful outfits and them telling him he was so lucky to have a talented wife! I have never knitted as much as I have for the last five years. I knit almost every day. I have too many projects to own up to and keep telling myself to finish one item before I start another. There is a lot of temptation out there to start something new and sometimes the yarn just leaps out of the shop or out of the webpage and says ‘please buy me’. Patterns, that’s another thing, I have to have a selection to choose from, don’t I? That’s what I keep telling myself when I accidently buy another pattern book. I know I shall never do every item in every book, or indeed every item on every single pattern, but a lady likes choice. I’ve been lucky enough to have worked in a knitting store too. That was fun! 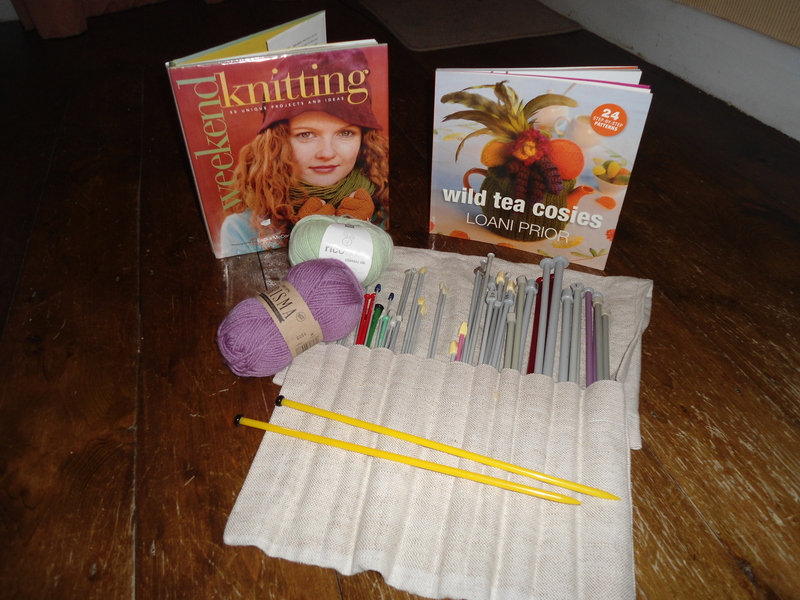 Wow, put a knitter in a knitting store – it’s like an alcoholic working in an off licence! Much of my stash has been from that era. I will use it all up one day, maybe, or maybe not ……. Watch this space. This entry was posted in Uncategorized and tagged cardigan, mattress, mohair, short row shaping, skein. 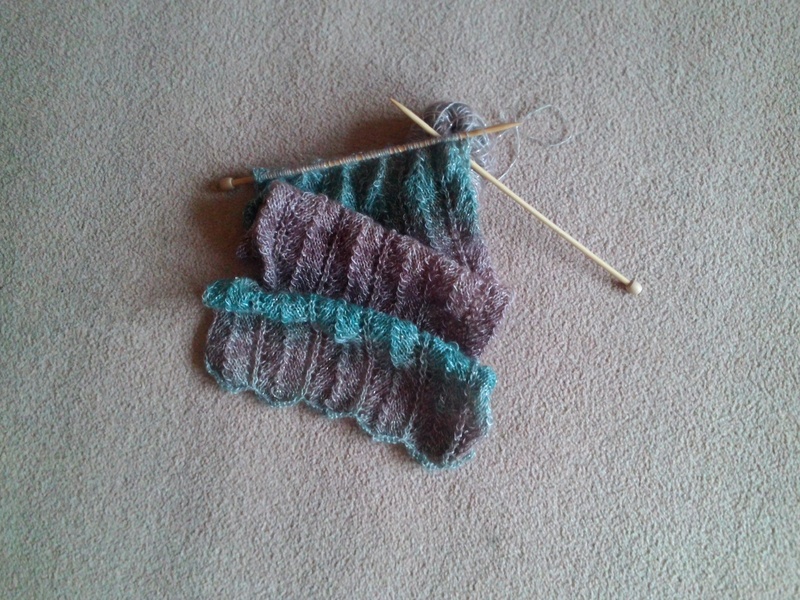 How come the last couple of things I have knitted haven’t turned out quite the way I’d hoped they would? What’s going on? I am trying to put it down to experience and learn from it but it is soooo annoying and I groan about the amount of hours put into something I just don’t like. I don’t think any knitter or crafter has always loved every item they’ve ever made. I think it’s all part of the learning process, but at this rate I will still be ‘learning’ when I am 94. My newly finished aran weight top just doesn’t look right on me. I’ve tried it with different clothes/layers/colours. I’ve held the shawl collar up at different angles to see if I could wear it as a crossover front top. I’ve even wondered about adding another rib to the waistline. I don’t think anything will work – so I’ve ‘hid’ it in a cupboard until I can decide what to do with it! I can’t bear to undo the whole garment and might even gift it to someone just to be rid of it. There is nothing wrong with it, per se, it’s just not ‘my’ style and it doesn’t fit ‘my’ shape. My second item, again newly finished, is a simple baby cardigan. I gave myself a non challenging knit to do as I watched the tv – completely in garter stitch which I haven’t tackled in years. Now I know why! Every slight wiggle in tension shows up, my picking up stitches for the neckband looks gappy, the sewing up could have been neater for the raglan seams! All in all, I really don’t think its up to my usual standard. I have thought of decorating along the neck border, perhaps with some kind of flowery stitch, as if it’s supposed to be there. Not sure if that will work, so it is joining the aran top in the cupboard …..
Needless to say, I’ve been cautious about starting something new for a week or so. It is really difficult when I am surrounded by such yummy yarns and the season is changing to Spring. I start thinking about new things and chucking out the old (in my case this means putting away any winter WIPs and panicking that I haven’t begun any summer projects!). I go into my spare room, view my stash, I visit a friend in a wool shop, I belong to a knitting forum , you could say I live in a rather woolly world. There is a lot of inspiration out there, I admire so many peoples skills, and I itch to begin a new project which I am sure WILL work out. So, latest new project began yesterday. It’s a petrol blue mercerised cotton shrug, for me. If I get to wear it this summer I will be happy, yet as it’s a little lacy and each row takes a little longer than my usual chosen style of knitting, if it doesn’t make it as a finished garment until next summer that will be ok too. After all, this knitting lark is supposed to be fun, isn’t it? This entry was posted in Uncategorized and tagged garter, mercerised, WIP, woolly.